Can you grow carrots indoor? And the truth is that it is not as hard as you might think. Growing carrots indoor can be done by just about anyone. If you are a beginner gardener, you can grow your carrots indoor by using a container. If you lack space, use containers to grow your carrots too! You can grow baby carrots with this method also! And if you have carrots scraps, you can do a neat activity with your kids! Can you re-grow carrots indoors? Yes, you can, but you won't grow carrots this way. As a beginner gardener, my first attempt at growing carrots indoor went very well. I also was able to re-grow carrots indoor too. 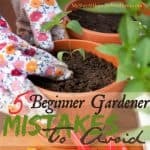 As one of my beginner gardener mistakes, and over growing plants was one of them. But overall, I enjoyed working in my own garden and growing my carrots in a container and indoors. How to grow carrots indoor? To grow your carrots indoor, this is what you need to do. I started with a medium pot and planted them there, and I grew baby carrots. Now, I made sure that my containers were at least 8 inches since I wanted to raise some baby carrots for my baby. The deeper the container, the more significant the carrots will grow since the pot will give them more room to grow. You can also follow me via Instagram to see how my 2017 garden season is going. If you are interested in growing carrots indoor here are some basic steps you can follow to start growing your carrots. Pot – At least 8 inches deep or deeper for longer growing carrots. Potting soil – I recommend good quality soil. 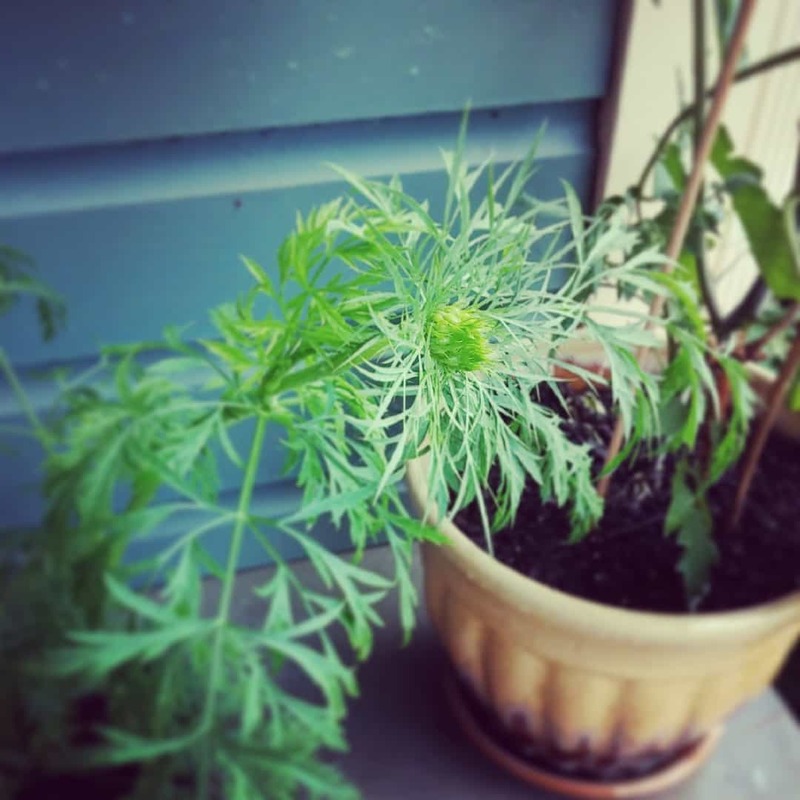 Carrot seed packet – I used Burpee Seeds, but you can use another good quality seed. Fill the pot with potting soil and leave about an inch of the top. Use water and moisten the soil. Sprinkle the seeds over the surface. Don't worry about spacing them out. Place your pot with carrots near a sunny window. Water when you see the soil getting dried. When the carrots start to germinate, use a pair of scissors and start clipping out seedlings and leave about one-half inches between the seedlings. Do this again when your seedlings are about 2-3 inches tall by thinning them again and this time make sure you have about an inch of space between them. Follow the recommended on the carrot seed packet. 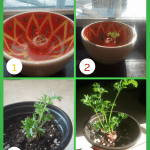 Re-growing carrots indoors are simple and activity that you can do with your kids. There are many vegetables you can grow from scraps, but I will admit that regrowing carrots from scraps was one our favorites things to do. It wasn't hard to do nor expensive, and it was something that my kids seemed to enjoy. 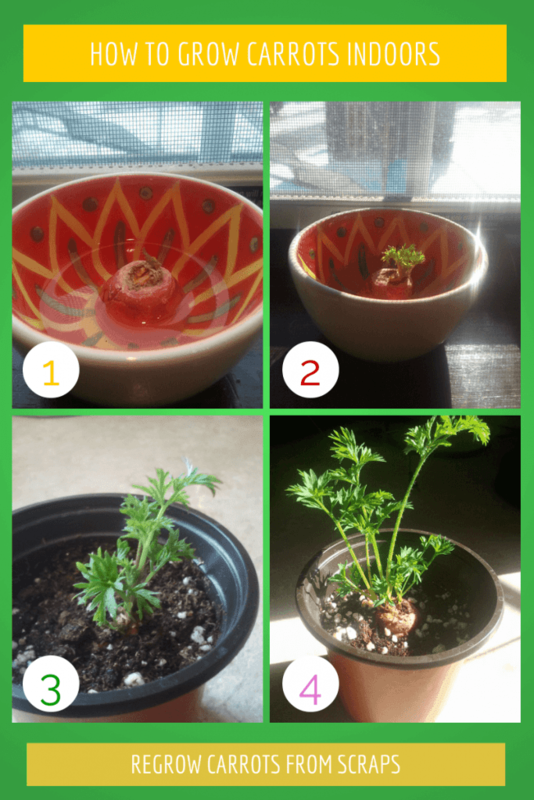 To regrow carrots indoor we used the carrot tops method. We simply used our leftover raw carrots and cut about an inch of the top of the carrot or carrots. Place the carrot or carrots on a plate or a saucer and filled it about halfway to the top of the carrot top. One thing that we did was change the water frequently. After a few weeks, we planted the carrots into pots full of soil. After transplanting the carrots to the pots, they seemed to thrive and grew faster. Again we watered when needed and took good care of them. No carrots will regrow as this is not possible, but you will be able to watch the plants grow and see a flower. Once the flower provides, carrot seeds use those seeds to plant more carrots. Now if you are planting carrots this year and need more information on how to save carrots seeds you can find it here. 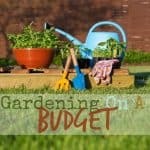 If you are deciding to start gardening this year, go for it. 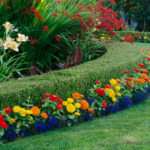 I believe that everyone should try gardening at least once in their lifetime. Growing something green will change you I swear. I know it did me! I sure made some beginner gardener mistakes but when doing my research I was able to grow my vegetable garden that year, and I have never looked back. The reason I was intimidated about growing my own carrots was, well, I never done it before. Also, I was trying to be so careful not to fail at gardening that I thought re-growing and growing carrots on my own required some expertise and boy, was I wrong! Carrots are an excellent source of beta-carotene. Beta-carotene is essential for skin health, eyesight, and growth. They are an excellent source of vitamin C, fiber, and potassium. Carrots are amazing; they also have vitamin B6 and other minerals and so much more. Carrots can be frozen too, and it is easy to do. After you thawed your frozen carrots, you can pretty much do anything you can with them. Meaning that after they are thawed, they can easily be cooked, steamed, or even microwaved. So keep that in mind when you are growing your carrots. First, you need to peel the carrot and cut them into small pieces. Follow by blanching the carrots for about 2 minutes. Blanching is cooking the veggies or food in boiling water and removing them and placing them in iced water to stop the cooking process. After their deep iced water batch place the carrots in freezer containers or bags. And that’s it! If you are looking for more creative ways to plant carrots check out this fantastic guide that will show you how to plant carrots and innovative ways to grow carrots. 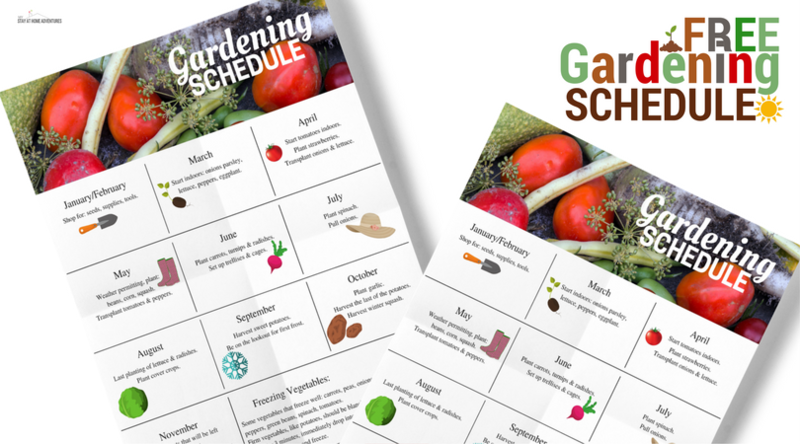 I hope you decided this year that you are going to give gardening a try. 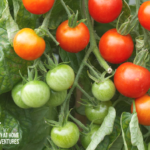 I guarantee that the benefits of growing your own food are tremendous. Click the photo to subscribe. To help you get started with your gardening adventure and help you not fail this season we are offering a free gardening course for beginners. To get this email course simply sign up using your email address! 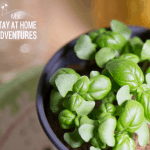 When it comes to gardening, what other helpful tips do you have to not fail at gardening? Click the image and grab your download. Your turn: Now that you read how to grow carrots indoor what other tips do you have for us?